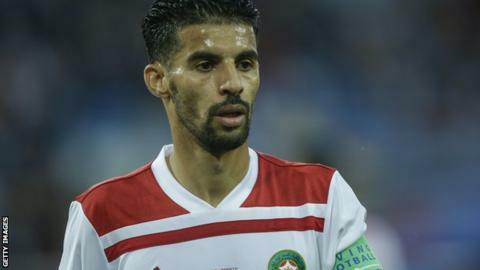 Veteran Morocco international midfielder Mbark Boussoufa has joined Saudi Arabian club Al Shabab until the end of the season. He moves as a free agent after he his contract with Al Jazira in UAE ended in July last year. The 34-year-old played all three of Morocco’s games at the 2018 World Cup. It will be the ninth club of his career, which has included stints in Netherlands, England, Belgium, Russia and UAE. Born in the Netherlands, Boussoufa started his career at ASV Fortius before youth spells at Ajax and English club Chelsea, ahead of a switch to Belgian side KAA Gent in summer 2004. Nicknamed ‘king of the assists’, he scored 16 goals and provided 22 assists in 74 appearances as well as winning the first of three Belgian player of the year titles in 2006 with Gent, prompting Anderlecht to snap him up in July 2016. He played nearly 200 matches for Anderlecht and scored 60 goals for the Belgian giants, winning two league titles, a Belgian Cup and two Super Cups before joining Russian side Anzhi Makhachkala in 2011. After two years at Anzhi, Boussoufa joined the exodus from the club by swapping the big-spending side for Lokomotiv Moscow. He helped Lokomotiv to a first trophy in eight years as he scored in the 2015 Russian Cup final and provided an assist. Boussoufa moved to United Arab Emirates club Al Jazira in 2016, won the League title in 2017 and played in the 2017 Fifa World Club Cup. Eligible for the Netherlands, he opted to play international football for Morocco rather than his country of birth in 2006. He has seven goals in 65 caps for the North Africans and played in two Africa Cup of Nations tournaments in 2012 and 2017.